Where and how the writer sits or stands is maybe not as important as the final product but nevertheless it is important. A writer cannot escape the fact that he or she must have space to write. A chair is just as important as a pen or a typewriter or a computer, the chair maybe a conventional chair, four legs, a stable, raised surface, or it could be unconventional; Erasmus tells us that he composed The Praise of Folly while sat on a donkey. There is a great deal of humour in this fact as there is in the book. One wonders if a slight bump in the road caused a passage to be composed. It is a very funny book. A small book but very funny. It is not surprising that it is a small book. I do not think Gaddis could have written The Recognitions on the back of a donkey. 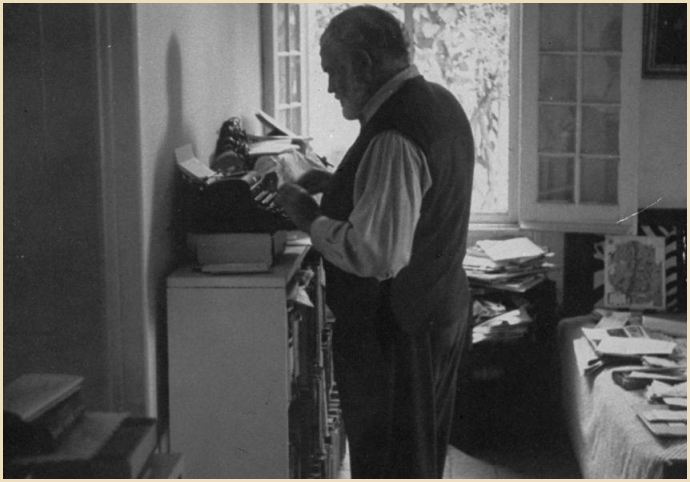 Hemingway was proud of the fact that he wrote his The Sun Also Rises while standing up, but the other great books he wrote sitting down. A writer sitting down will look around him. The colour of wall paper will inevitably find its way onto the page, the colour of the sun could be blue, as happens in a painting of Cezanne, the clouds could be a golden yellow, it all depends on the colour of the wall paper. A tree swaying outside will sway on the page, the carpet that nozzles the feet, the light that illuminates, a dog barking, a cat meowing, a kettle whistling, a baby bawling, a wife complaining, a husband demanding to know where the sugar is will influence the story just as much as a cold in the head of the writer. Genet wrote his book Our Lady of the Flowers while sat on a prison bed. When one reads Our Lady of the Flowers one can almost feel the hard bed underneath the buttocks. Marcel Proust not only had a room of his own, which was corked, but a bed to lie in, while he constructed his labyrinthine sentences that go on and on, that are mellifluous, dreamlike and filled to the brim with metaphors and similes that draw upon the whole universe of things, that make up his opus À la recherche du temps perdu. Franz Kafka wrote The Castle in an office surrounded by paper. The Castle is all about paper as the Heart of Darkness is all about the jungle. The writer cannot escape his or her environment. Inevitably the environment will have a bearing on the text as it must upon the writer’s state of mind. Jack Kerouac wrote his book On the Road while On the Road and one can almost smell the inside of the car the bus the truck as he hopped from one to the other. Alfred Döblin wrote Berlin Alexanderplatz on a tram and everything he saw as he journeyed up and down on that tram has found its way into the great book; the book is crammed with street signs, advertisements, street urchins, the reek of overflowing gutters, it is all there. Writing with only one hand can have a great effect on the literature. The Marquis de Sade wrote The 120 Days of Sodom or the School of Licentiousness with his eyes closed and with only one hand free. João Guimarães Rosa wrote The Devil to Pay in the Backlands with a gun in his hand. Jean Rhys had a glass in her hand. One finds oneself quite drunk after reading Jean Rhys. François Rabelais was dead drunk when he wrote Gargantua and Pantagruel. Jean-Paul Sartre must have composed Nausea with only one hand. Jean-Paul Sartre wrote Nausea sat at a lovely café in Paris while sipping on coffee and smoking a Gitanes. We know that Gaius Petronius Arbiter wrote lying on his side. Romans found this position best while feasting and we know that Gaius Petronius Arbiter wrote The Satyricon while lying next to The Emperor Nero. Bruce Chatwin wrote In Patagonia while standing on his head, everybody in Patagonia stands upon his/her head. But the best must be Lawrence Sterne who wrote The Life and Opinions of Tristram Shandy, Gentleman, while still in his mother’s womb. No wonder the book is full of twists and turns. One dreads to think where Joaquim Maria Machado de Assis wrote The Posthumous Memoirs of Bras Cubas. Paul Kavanagh’s ‘The Killing of a Bank Manager‘ is out now on Honest Publishing, priced £7.99/$12.99. This entry was posted on Saturday, April 30th, 2011 at 6:00 pm and is filed under Articles, Articles, Honest Publishing Blog, Writings. You can follow any responses to this entry through the RSS 2.0 feed. You can skip to the end and leave a response. Pinging is currently not allowed.